Last week I was out of town for work. We were in the Bloomington/Normal Illinois area, and based on nothing but a hotel magazine advertisement, we chose a place called Biaggi's for dinner. It's a small chain Italian place, but I had never heard of it, as there are none located anywhere near the STL. I was quite pleasantly surprised by how good the food was! 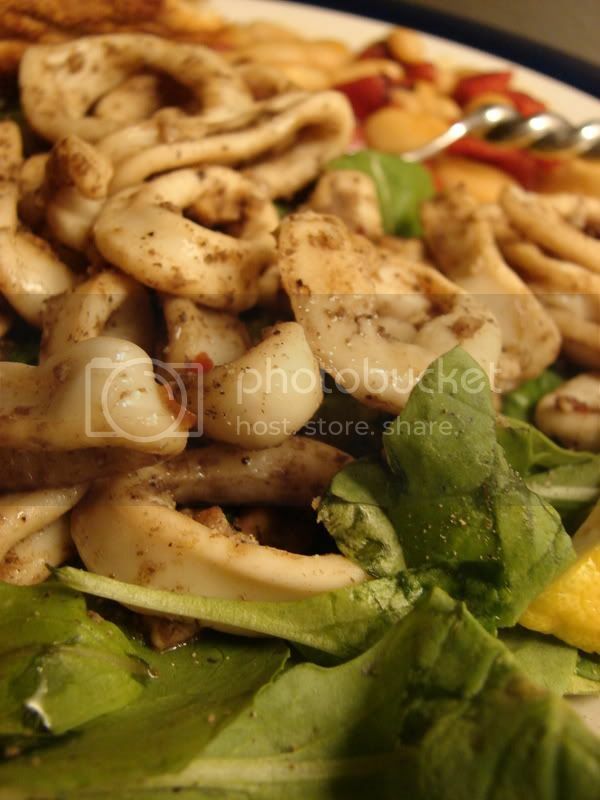 For an appetizer we had the Calamari Alla Griglia, "Tender marinated calamari, lightly grilled and served over arugula with extra virgin olive oil, tomatoes and balsamic vinegar" and it was probably the best calamari I've had anywhere. It was grilled, which was a first for me, and I loved the slight smokiness. 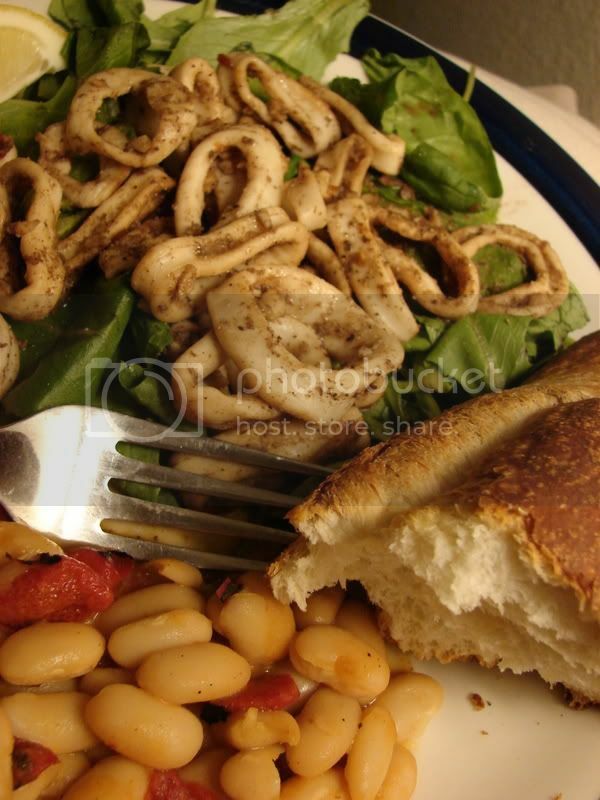 So I had a bag of frozen calamari waiting for me in the freezer, and decided to pull it out to try and replicate Biaggi's for a quick and easy Monday night meal. Well, it wasn't quite so easy because I was apparently being far from smart that night...I ended up ruining the seasoning on our cast iron skillet that Jack had worked for about a year to get to where it was. Yeah Balsamic vinegar AND frozen seafood liquid are big no-nos...I just wasn't thinking. Oh well, I salvaged the meal using another pan, and now I get to learn how to season cast iron! My favorite part of the meal, and something I'll probably be making a lot, was the improvised side dish of cannellini beans and roasted red pepper. I sautéed some garlic in olive oil, added a can of the beans, salt and pepper and a roasted red pepper from a jar, which I chopped up. I'm always looking for new, easy side dishes. 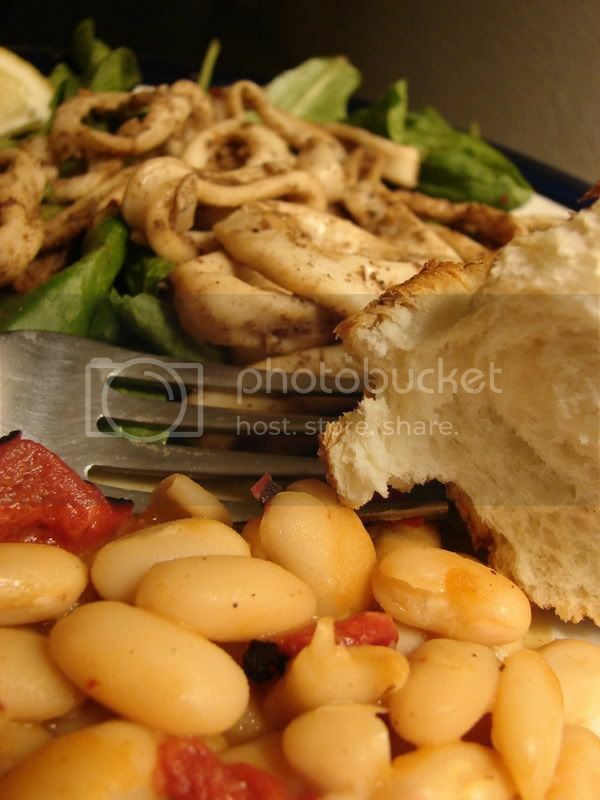 The next day I had the leftovers for lunch...I added the beans to leftover calamari and arugula and ate it cold, like a salad. Like a really good salad.